Get three Star Wars Blu-ray discs free with Panasonic bundles | What Hi-Fi? If you pop down to London's O2 this weekend, you could be one of the first to get your hands on the Star Wars Episodes IV, V and VI Blu-ray discs as part of Panasonic's latest promotion. Panasonic Store Lakeside will be exhibiting on stand 1 at The Big Screen Event (see below) and will be offering the free Blu-ray disc deal with selected Panasonic Blu-ray players and home cinema systems, including the DMP-BDT210 BD player and SC-BTT370 BD system. The bundles on offer will also include four 3D movies, one of which is Avatar, so that's seven discs in total. Buy one of the special Panasonic packages, redeem your free Blu-ray discs voucher online, and you'll receive the Star Wars BD triology at home on September 12th. 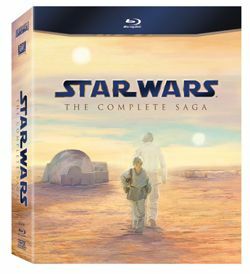 Head down to London's O2 between August 12th and 14th and you'll get to see a preview of the forthcoming Star Wars: The Complete Saga release on Blu-ray. The Big Screen event, hosted by Empire magazine, will feature the latest Panasonic Viera TVs and Blu-ray systems, plus AV furniture from Sanus. Visitors to the O2 Indigo and Cineworld facilities will be shown feature premieres, exclusive screenings, movie master classes and debuts of new film footage. On Friday, August 12th the O2 Indigo will play host to key members of Industrial Light and Magic who will take fans on a behind-the-scenes journey of the Star Wars films and reveal new content to be featured on the Blu-ray releases. As part of the event, Panasonic will supply TX-P55VT30, PX-P65VT30, TX-P46GT30 and TX-P50GT30 plasma TV screens. They will be supported on Sanus Java JFV60, BFAV550 and BFV145 stands. For more details on the Star Wars Blu-ray release, see our earlier news story.